Located on 3279 M St NW, Sugar Lab is THE hot new dessert place you need to check out in Georgetown. 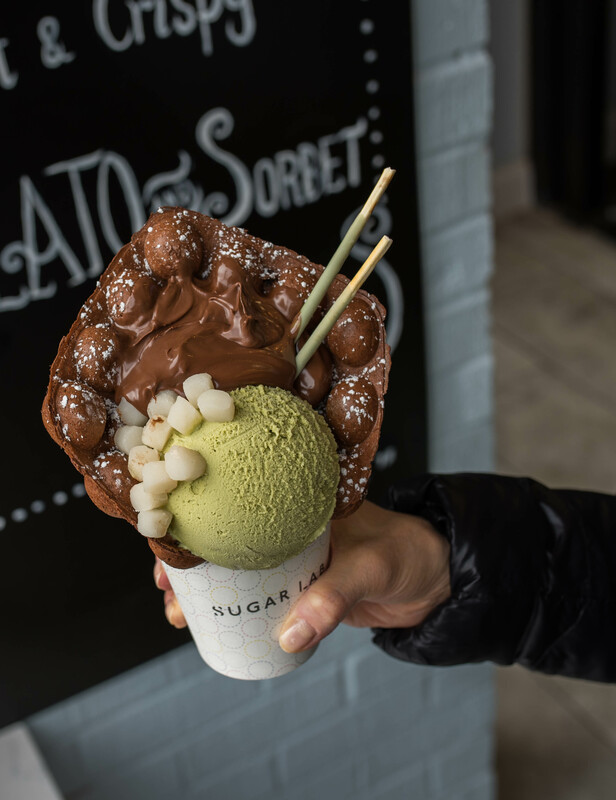 Run by sibling duo, Cathy and Hung, they offer artisan gelato (all made in house), piping hot egg waffles and bubble tea. On top of having cool flavors like matcha, cereal n’ milk, and nutella, they have several different vegan options so there’s something for everyone aka bring all your friends and family. We got three different things to share, and everything legit blew us away. First up, their chocolate egg waffle with matcha ice cream, nutella, mochi, and green tea pocky (pictured above). You see that giant dollop of nutella? Yeah, they don’t mess around here. Their bubble waffles are $8.99 a pop, and they come with a giant scoop of gelato, 3 free toppings, and a drizzle of your choice. Their lemon sorbet’s typically our go-to, but now that we’ve tried their matcha, it’s game over. It’s honestly some of the best matcha ice cream we’ve ever tasted, and we can’t wait to go back for more. This was the first time we tried their boba so we weren’t sure what to expect, but we were seriously impressed with their Rose Thai Iced Tea. And yes, it tasted as good as it looked, if not better. We’re not into super sweet drinks so we asked Kathy to use less sugar, and it was perfection in a cup! We haven’t tried any of their other flavors so we don’t know how those are, but if you’re in the mood for boba, definitely make sure to give this baby a try. Anddd onto the final dessert of the day: their matcha bubble waffle with boba and bubble tea milk foam drizzled with chocolate sauce. We can’t even begin to tell you guys how much we enjoyed this unique combination. We’ve never had bubble tea milk foam before, but now it’s all we want. It doesn’t really look like anything special, but trust us when we say, the photo doesn’t do it justice. The texture game is SO strong – the softness of the waffle coupled with the chewiness of the boba? So much yes. Dip the waffle in the foam and repeat. If you like interesting sweets, definitely head to Sugar Lab stat to try this nom. So, what did you guys think of Sugar Lab? Do you want to try their desserts or eh? Where do you typically go for sweets in Georgetown? Definitely let us know by leaving a comment below, and check back Thursday for fresh new content. For more on the DC food scene, check out this tab! Until next time, Nomsters.